I Want Bland & Boring Bookshelves! Interior decorators are always messing around with what are-- to me-- vital pieces of furniture in any house. 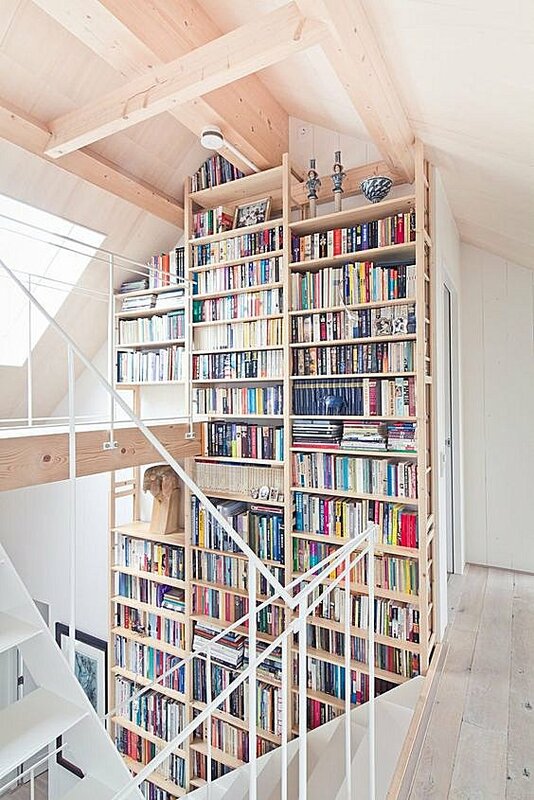 To many of them, bookshelves are bland and boring, and they're constantly trying to come up with ideas to spice them up. Enough with the spice, I say! I want bland and boring bookshelves because I'm going to fill them with books, and the books will be absolutely beautiful in and of themselves. I've pulled a couple of photos of the books and bookcases in my house, one fairly recent and one not, to show you that I don't need spicy bookshelves. 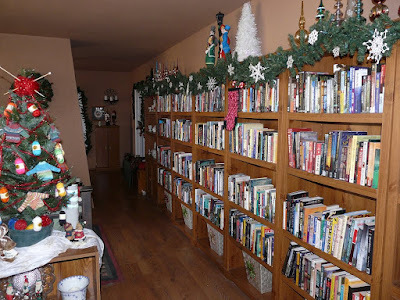 The photo above is of my to-be-read shelves, and the only time I believe in gussying them up is for Christmas when it's with a garland, finials, and carolers on top. Well, and some festive faux greenery on the bottom-row baskets. Those baskets on the bottom shelf mark me as a bit eccentric. I don't like standing on my head to try to see which books are down there, so I use baskets to store seldom-used items instead. 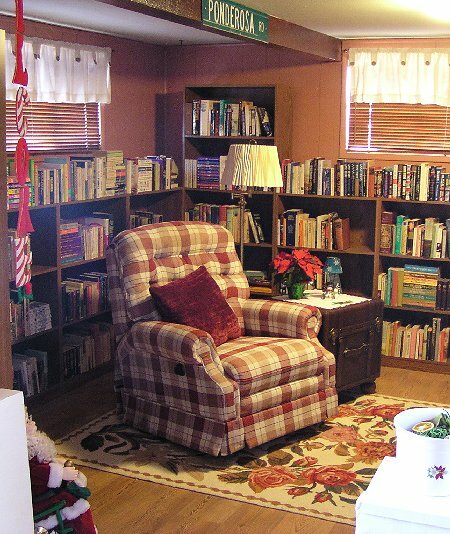 Here is what my library (yes, I had a dedicated room in the house for books) used to look like. If it had remained a library, the only thing I would have changed is to have custom-made shelves to fit around the windows and corners perfectly. Flat-pack bookcases just can't handle those sorts of transitions. As you can see, my idea of interior design when it relates to bookshelves is rather bland and boring, and it doesn't bother me one little teensy weensy bit. I used to watch a fair amount of HGTV, and whenever an interior designer proudly showed off bookcases in which books were displayed spine-in or covered in plain white covers, my reaction was a very unladylike snort. I'll be charitable and say that the designers probably don't intend the books to stay that way and that they're only displayed in that manner so they won't take the focus away from the room's design, but please! If they actually do believe books should be shelved this way, they're nuts... or have photographic memories. Many of my reactions and opinions come from growing up in a library. In a public library, the focus is on the books, and they should be organized and shelved in a way that makes them very easy for everyone to find what they're looking for. That's been my bookish interior design mantra my entire life. Another way to shelve books seems to be by color, and I've seen some results that are very attractive, but this method just isn't practical in my opinion. It might be for a small collection of books, but not for a large one. As I've said, I grew up in a library. Literally. My mother was the librarian of the village library in the small farm town where I grew up. The books were not shelved using the Dewey Decimal System because it wasn't practical for our patrons. Books were shelved by genre, alphabetically by the authors' names. It's a system that works well for me to this day. 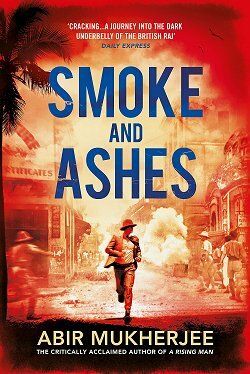 Looking at the photo makes me remember this line: "I don't remember the title, but the cover was blue." I've seen this touted by designers for people living in small spaces, and it just doesn't make sense to me. Why would you want to have all those lovely bookshelves-- and then shove your furniture right up against them so you can't use every last bit of storage space? If I absolutely had to do this, I suppose I would use those shelves to store keepsakes that I don't want to display but refuse to get rid of. There's certainly no way that I would put something back there that I'd have to move heavy furniture back and forth to get at! If nothing else, this post shows you how cranky I can be, doesn't it? Now... doesn't the shelving in the following two photos look absolutely stunning? 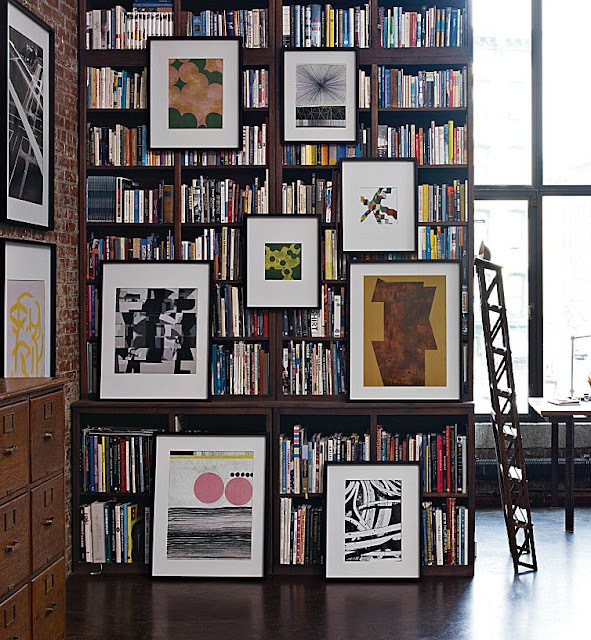 No matter how eye-catching and impressive the bookshelves are in these two photos, I wouldn't have them in my house. I don't know about you, but I've never wanted to risk life and limb to get my next book to read. 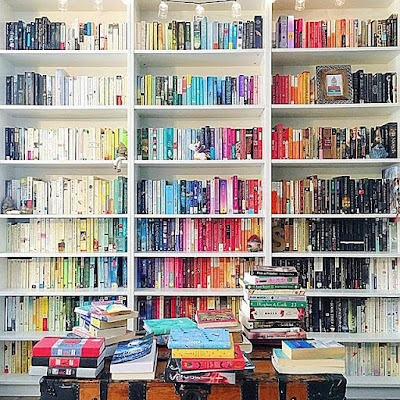 You can't even see how to get at some of the sections of books, so to me, this interior design ploy is all about showing off and has very little to do with the actual reading and enjoyment of all those lovely books. Here are the last two photos I'm using to illustrate another design tactic that makes little sense to me. As I've worked my way through this post, I think I've come to the conclusion that many interior designers are not readers and know little about the proper way to showcase books. If I were ever to win the lottery and be able to build the home of my dreams, I think the first question I would ask both architect and interior designer would be--- Do you read? Now it's your turn. What do you think of my choices? Do they irritate you, too? Inquiring minds would love to know! I'm with you Cathy...I want functional bookshelves not fashion statements...but I often think that with designers...many of the kitchens I see on HGTV and similar types of shows are pretty but would be uncomfortable to actually cook in. 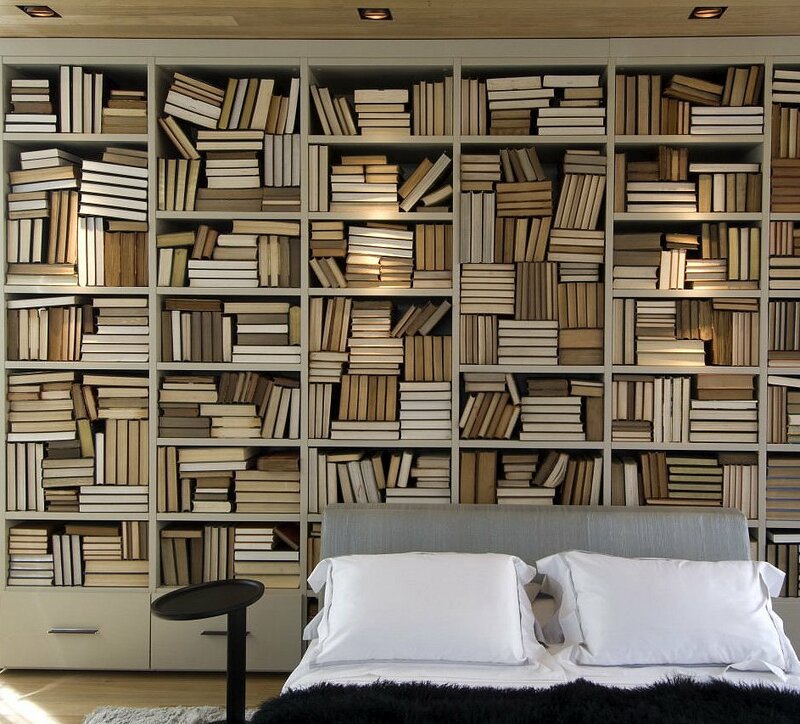 I agree with all your critiques of "designer" bookshelves. I want to see my books and I want access. I don't like paintings hung on the shelves, hiding books, which I agree, are wonderful by themselves. I am hottified by very tall bookstores, requiring ladders. I can't do ladders since I broke a femur years ago, and even looking at those high shelf units makes me break out in a cold sweat. And I don't like books covered up or sorted by color. Huh? I look at my bookshelves which are near my computer. Some are straight up, some are stacked, but I can see all of their spines. And I do have pottery, small sculptures, a Go set and a basket full of cd's on the shelves but next to the books where there are spaces. Lots of wood around. 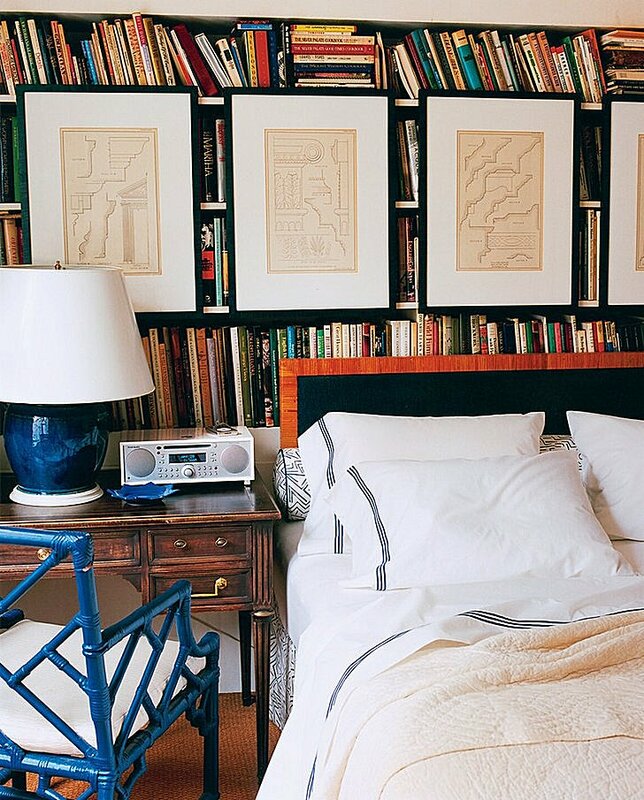 I grew up with bookshelves around and they make me feel comfy and dozy in my apartment. What makes me nervous are the stacks which are not on shelves, but on tables. I haven't done ladders for a long time--ever since I fell off the top of a 16-foot ladder in the stockroom of the store in which I worked. Thankfully I fell onto the pile of boxes filled with socks and men's underwear that I'd pulled to stock the shelves on the salesfloor. Errata: should be "horrified," not "hottified." And I have shelves allocated by topic, but not in any type of order. And two shelves of fiction. I couldn't agree more, Cathy! I like functional shelves. It's nice if they're visually appealing, but 'designer?' No, no need for that. For me, the joy of books is reading them, not looking at the shelves. You mention a very important point: I can't even imagine... no, I CAN imagine... what a hassle it would be to get all those books on all those shelves. No, no, a thousand times NO! I agree, Cathy. Book shelves should be for books that is why they are called 'book' shelves. Hello? Although I will say that I place little 'tchotchkes' on the shelves and small family photos and such. If I knew how to post my pictures on here I'd show you my shelves. But I seem only to be able to post them on my facebook page so maybe I'll go there. I love this post, by the way. Oh, and I have been guilty of placing small works of art on my shelves but only sparingly and always so that they can be easily moved to access books. So I am not totally guiltless. Ha. (My excuse is that I do live in a small apartment and I'm always running out of tchotchke space. I saw some of your shelves in your previous home, Yvette, and they were wonderful. (Remember when I did "Scene of the Blog"? )I'd love to see the ones in your new place. My library at home was pretty organized, but not perfect, my favorite authors were always grouped together. 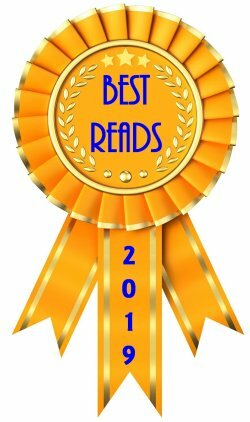 But I also loved mysteries, of different authors, so mysteries were grouped together, etc. However, my new "garage library" is pretty much helter-skelter, and the shelves are actually left-over moving, Amazon and Walmart boxes and I never know when one might collapse and send books over the garage floor. Perhaps come spring and warmer weather I might do some re-arranging. Til then, at least I have a pretty good idea where everything is. I love books, and I guess even messy looking book shelves. I still must have a bit of librarian in me because the thoughts of organizing your garage library make me smile. I've spent some wonderful hours organizing shelves! I agree 100%! I don't think designers are readers either. It drives me crazy when they use bookshelves for decorating in all of those home improvement shows. And I have felt like crying when they demolish built-in bookcases in older homes. They are called bookcases or bookshelves for a reason. Not a hangingartinfrontofbookscase or a picturedoodadscase. No, they are bookcases made for books so you can see them and read them and love them. "...So you can see them and read them and love them." <-- Perfect! 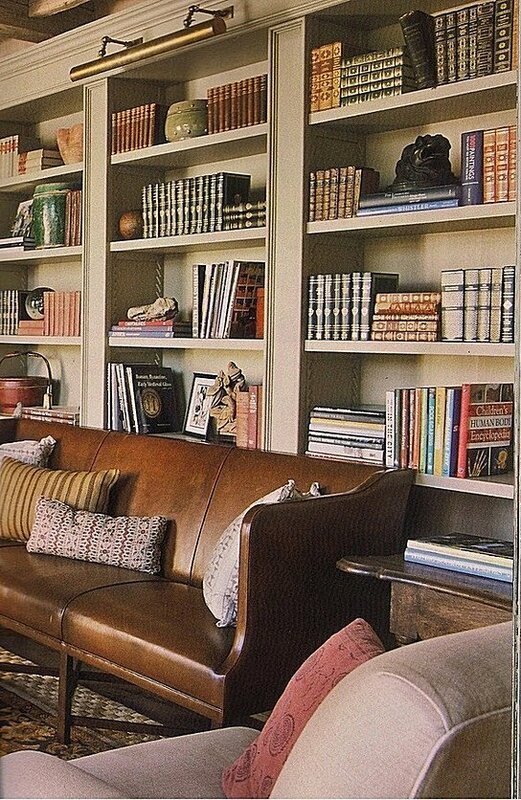 I agree that I am upset when I see bookshelves being demolished in older homes. 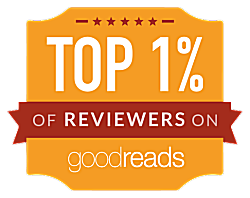 But what it means is even more disturbing: that people aren't reading books and don't appreciate them. My mind doesn't even want to think about that, although I know what you say is true. I agree with every word you wrote! 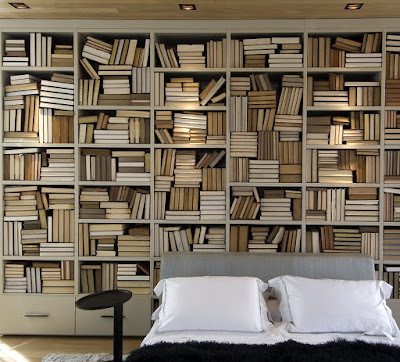 I can't even look at those designer bookshelves. I love a room with books on the bookshelves. 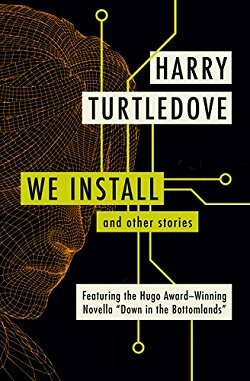 Books that don't match, in size or color or sometimes any way at all. I love my books. I walk around and notice them all the time. I love the ones I've read and the ones I haven't gotten to yet. They make me happy and peaceful. I love your shelves. Me, too. My bookshelves bring me peace and comfort, along with all of the pottery et al., on them, but not covering the books. Also, another point of nostalgia: Books are on those shelves that belonged to my parents, or beloved friends and partners, gift books, and those I've gathered since my early 20s. So I often think of the people who owned them or gave them to me, even the cookbooks and hiking books. They mean something to me. Same here. I have multi-generational books on my shelves as well as mine...even gifts to me dating back to when I was a very small child. 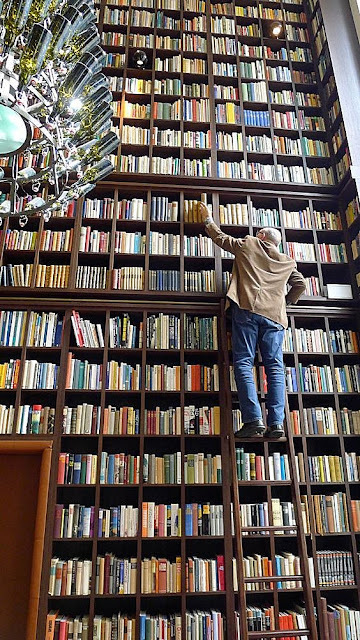 The heights of those tall shelves turn the books on them into a wall decoration rather than something you could look through and choose a book from. Aside from the fact that just looking at those pictures makes me imagine all the bones I could break falling from the ladders. The placing of pictures in front of the books almost comes across as if the owner is apologetic for having the books to begin with and is trying to hide them. Don't think much of shelving books by color. It's almost as bad as the trend of buying books by the foot, in order to fill your shelves with books that you've never read and probably never will, for the sake of decoration. On the other hand, you'll know instantly when you're in the house of a book lover, because the collection proceeds organically, and will make you feel at home just looking at it. Yup. Well said, as though you read my mind. I have two rooms dedicated to books and my bookshelves are bland and boring because I like the books to be the center of attention. When I move I'll be only taking the books I feel I "have" to keep. It's going to be so sad, but I'll be giving away a lot of books and donating most to the libraries in my area for their book sales. So many books, not enough room in the new house. I do, indeed, feel some of your pain. I used to have well over 6,000 books here in my house. My library now has somewhere in the neighborhood of 2,000 volumes. That was a lot of cutting for me to do. I still have my Winnie the Pooh book, but many I had at my parents' house were not kept, not my doing. I would have kept them. But parents moving meant my old books went somewhere. When I just looked at that top photo of the tall shelves, requiring a ladder, I got dizzy. And I also imagine myself falling and breaking bones. How does anyone do that, especially over the age of 30? That's why I think those are mainly "show-off" displays. They're just too impractical. Agreed. They're decor, not for reading.